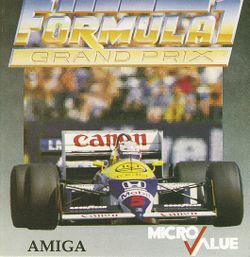 Formula 1 Grand Prix is a racing game released for the Commodore Amiga in 1988. As with most Amiga games, the joystick should be plugged in Port 2. 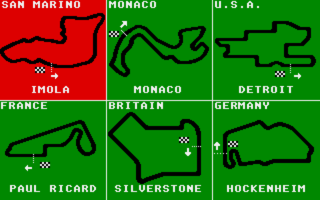 There are six tracks: Imola, Monaco, Detroit, Paul Richard, Silverstone, and HockenHeim. 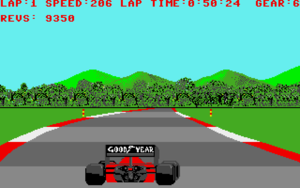 The default track is Imola, but can be changed from the main menu. Timed Practice: You complete laps on the selected circuit without competition. One Race: You complete laps on the selected circuit with other races. Complete Season: All tracks are selected for play. When the race starts, accelerate as quickly as possible to the maximum speed; the best time to switch to a higher gear is when the RPM is between 8000-9999. You can attack almost all turns at full speed, as long as you only steer during the turn without continuing acceleration. This page was last edited on 13 January 2010, at 17:35.